Hilton Dubai Jumeirah announces the opening of a brand new Wavebreaker Beach Club. The club is an extension of the famed Wavebreaker Beach Bar & Grill. The extensive beach expansion offers guests a private beach experience with fully licensed F&B offerings and a family friendly atmosphere. Occupying the area from Hilton Dubai Jumeirah to the neighboring property, the fully licensed private beach outlet will be serving food and beverages on the sunbeds throughout the day and offers great day rates. 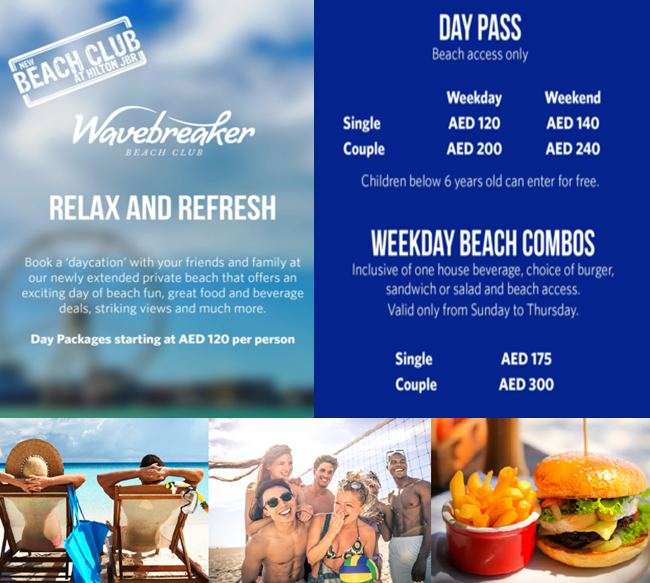 Wavebreaker Beach Club is the go to destination for families, couples, and friends looking to have a memorable day out. Beach access can be enjoyed by guests of all ages, giving the little ones the chance to frolic amongst the waves and build sandcastles to their heart’s content, while adults can unwind as they sip on a refreshing beverage. Volleyball facilities will also be made available, ideal for the cooler months, whereby guests can break a sweat while taking on the competitive spirit of the game. Tailored packages are available for groups of all natures, ensuring the seaside experience is thoroughly enjoyed. Beach enthusiasts can also make a full day of the offer, and tuck into an array of sumptuous dishes on offer, such as the iconic burgers the venue has come to be known for, savory sandwiches, or a piquant salad, to be accompanied by a flavourful beverage, from the comforts of their sunbeds. A la carte options will also be available to be sampled throughout the day, should guests want to embrace the complete Wavebreaker experience. For nearly a century, Hilton Hotels & Resorts has been proudly welcoming the world's travelers. With more than 570 hotels across six continents, Hilton Hotels & Resorts provides the foundation for memorable travel experiences and values every guest who walks through its doors. As the flagship brand of Hilton, Hilton Hotels & Resorts continues to set the standard for hospitality, providing new product innovations and services to meet guests' evolving needs. Hilton Hotels & Resorts is a part of the award-winning Hilton Honors program. Hilton Honors members who book directly through preferred Hilton channels have access to instant benefits, including a flexible payment slider that allows members to choose nearly any combination of Points and money to book a stay, an exclusive member discount that can’t be found anywhere else, free standard Wi-Fi and digital amenities like digital check-in with room selection and Digital Key (select locations), available exclusively through the industry-leading Hilton Honors app. Begin your journey at www.hilton.com and learn more about the brand by visiting news.hilton.com or following us on Facebook, Twitter and Instagram. Handy Scandy has got you covered!